AMT brings back BATMAN’S sleek super-plane, the BATWING, from Tim Burton’s blockbuster 1989 BATMAN™ film. It’s opening canopy reveals more detail like BATMAN’S sighting scope and the Caped Crusader himself in the pilot seat. The 1989 BATMAN™ movie re-introduced movie audiences to a more gothic version of the character; the likes of which had never seen before on screen. It’s black leather armor established the hero in the real world and was the perfect look to make Gotham City’s criminals to run in fear. Otherwise in good condition as shown. Hard to find Batman Batwing 1/25 scale model plastic kit by AMT. (See photos). Batman Trailer (1989) - YouTube. 1:25 Scale Plastic Model Kit. Simple kit for young modelers, only 18 parts. 1:25 Scale. Includes full color backdrop display. Reissue from AMT/Round 2Part Number:AMT-1025. This is a AMT Ertl Batman Batskiboat Plastic Model Kit. The box has been opened, but the pieces are still sealed in their baggies. The box is worn a LOT and shows a LOT of wear. This item is being sold "as is". Box has wear, but model is new and untouched. Everything inside is sealed. AMT 940-12 Batman Stock Car 1/25 Scale Model Kit Brand new factory sealed kit. Snap tight. Easy kit. AMT BATBOAT Batman #1025/12. 1/25 Scale Model Kit New Sealed. KIT FEATURES • Simple kit for young modelers. • Includes full color backdrop display. Imperfections are more prominent on the scanned image than on the actual item. Here is a great AMT model kit. It is the Batman Batboat 1:25 scale kit. Kit is SEALED in original shrink wrap. 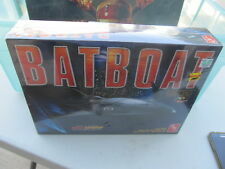 AMT BATBOAT Model kit 1/25 .FREE SHIPPING. AMT BATBOAT Model kit 1/25. Sealed in box. 1989 AMT/ERTL Batman Batmobile. 1/25th Scale. Model# 6877. This kit is in great condition and the box is still sealed in the factory plastic. Scale: 1/25. AMT ERTL Batman Batskiboat model kit, dated 2003. Still factory sealed. Among its gadgets, the craft features radar. This simple-to-assemble AMT model kit captures the BATBOAT in great detail. Parts can be snapped together and joints stabilized with glue if desired. It is injected in black plastic with dark tint clear window parts and a full color GOTHAM CITY underground river backdrop display. Scale is 1:25. Tried to take as many pictures as I could, so you could see all aspects of Item. Doesn't look like it was ever assembled. This will be an as is piece. THIS IS A FANTASTIC KIT IS OF THE ONE AND ONLY BATMISSILE. Kit still has plastic shrink wrap in place. The model kit is complete and unbuilt in the original box. Most of the parts are still attached to the original stems. See pictures for more details. We have a ton more diecast coming up, lots of Matchbox, Hot Wheels, ERTL, Solido. Plastic Model Kit. Photos of built car and box's shown only for visual. Not included. NOTE: Computer monitors and phone screens lighting and color setting vary and may give different hues or color tones. AMT Batman Batboat 1/25 scale model kit. A skill level 2 kit from Round2models that requires paint and glue(not included). Box does have slight shelf wear. The model kit is mint, still sealed in the original box. It also has a small dent at the top but it is still in decent shape overall. See pictures for more details. We have a ton more diecast coming up, lots of Matchbox, Hot Wheels, ERTL, Solido. Plastic Model Kit. I do my very best to describe everything as clear and concise as I can. NOTE: Computer monitors and phone screens lighting and color setting vary and may give different hues or color tones. THIS IS A 1/25 SCALE KIT STILL SEALED. THE MODEL INCLUDES 44 PIECES. THE BOX IS SEALED AND HAS CREASING. FREE Trial ! Brand new & sealed. 1/25th scale Batman Batwing model kit Please check out my other items for sale, I will combine shipping. Searching for an item to add to your collection?. 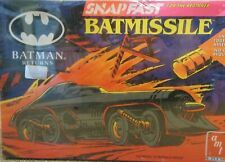 1:25 Scale plastic model kit of the Batman Batmissile. Kit #38038. Great kit @ great price.u cant go wrong! Snap together model kit released in 2003 no glue required. COLLECTABLES AND HOBBIES ARE FUN SO LETS MAKE THE BUYING EXPERIENCE FUN TOO.